A quesadilla is a wheat or corn flour Mexican tortilla, filled with a cheesy mixture of veggies, corn, beans and other ingredients, cooked on a tava, and folded into a half-moon shape. The lip-smacking fillings peeping out of the Veg quesadillas are sure to make one drool! Dive into this section to discover some irresistible recipes like Chilli Bean Quesadillas. The combination of corn works really well with paneer and cheese. Rich in protein , Paneer and Corn Quesadilla are a perfect snack to serve to your kids. The different textures and flavours from the crunchy sweet corn, tangy tomatoes, stringy mozarella and earthy coriander are a delight to the palette. Refried Beans Stuffed Whole Wheat Tortilla with Green Tomato Salsa is a healthy snacking option as it provides us with protein and iron resulting into healthy skin. Kids love exotic dishes from around the world – and so do we! 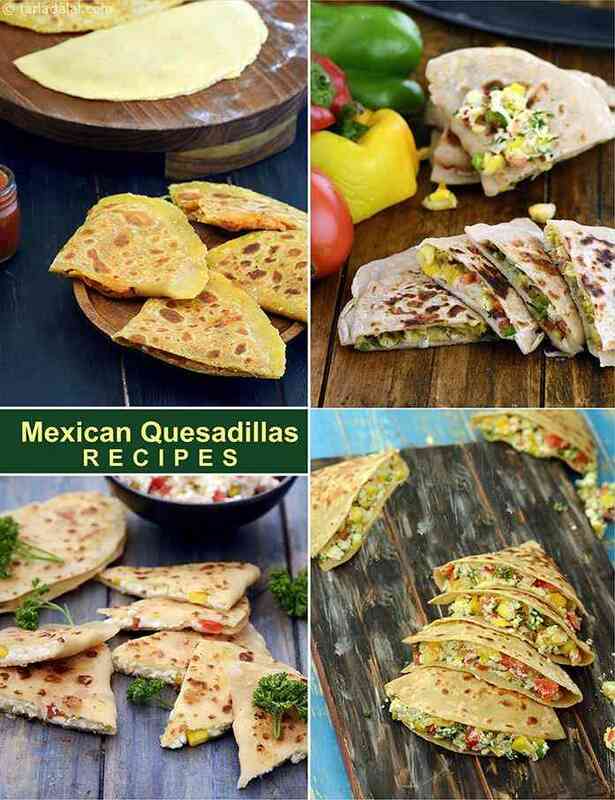 So, what’s stopping you from preparing these delicious Mexican Quesadillas Broccoli, Bell Pepper and Cheese Quesadillas or Corn and Cheese Quesadillas with an assortment of colourful vegetables , gooey cheese and flavorful seasoning. If you are looking for a quick-fix then these Chilli Bean Quesadillas made with readily-available ingredients like canned baked beans and cheese, takes hardly any time to cook. Give this videshi dish a desi treat and make Thepla Quesadilla a scrumptious dish, which can be had as a one-dish meal, or enjoy as an evening treat, along with a cup of hot Tea or a milkshake. Mexican cooks have lots of ways of stuffing a tortilla. This quick and easy one resembles a cheese paratha. A good melting cheese is basic to all fillings of quesadillas. Any other fillings are at the discretion of the cook. Do not forget to try this recipe when you have both leftover rice and chapatti. Broccoli and Mushroom Quesadillas is a kid friendly snack recipe with cheese, broccoli and mushrooms spooned into the tortilla cups and baked till done. Enjoy the healthy Mexican snack delight, quesadillas with sauce or plain. A delicious and easy to make snack made withleftover rotis and beans. An ideal starter or a tea time snack. This recipe is a very simple and home style version wrap. It is highly nutritious and lots of energy. This soya quesadillas is very unique and lip-smacking dish.